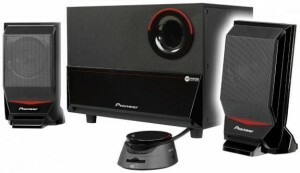 Pioneer usually makes products for home theater and hi-fi system, but it seems they began to plunge into the computer market by offering two new speaker system that is the type 2.0-channel S-MM301 and 2.1-channel S-MM751RU, which has been created for PC users / computer. 2.0-channel Speaker Pioneer S-MM301 comes features USB connectivity and a built-in audio control, featuring three coil drivers should be able to "deliver a dynamic sound with amazing clarity with the volume that is not offered by USB-powered speakers," and comes with a tag affordable price that is $ 49 only. While the speakers are 2.1 channelnya namely S-MM751RU come up with a more expensive price of $ 129, and will display the total power 40W - 20W to 10W subwoofer and speaker power - and bring the technology, dubbed Pioneer Maxx Bass sound with DSP Dynamic bass enhancement, in Pioneer claims which would increase the dynamic range and will provide a richer audio experience. A wired remote is included with the speakers and is equipped with the volume, control playback, USB and line-in audio port and SD card slot.